The VOIspeed 6 Graphical User Interface (GUI) is a centralised control application which manages user communication devices (e.g. SIP devices and mobile phones). 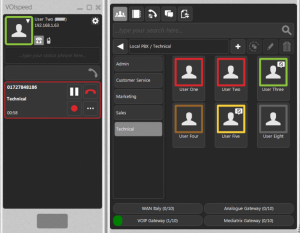 The GUI also monitors the activities of VOIspeed PBX users. VOIspeed 6 GUI works independently of any audio devices connected to the computer, allowing the application to run continuously, unaffected by any problematic audio device or compatibility issues with the operating system. These additional functionalities make the GUI much more powerful than any phone or soft phone. The GUI can be installed anywhere and user can also use it remotely. GUI compatibility isn’t restricted to USB devices; it can be used with an IP phone or USB phone or almost any type of communication device. VOIspeed provides the users with real time information on their availability and presence. The colour of the boarders of the user icon differentiates between the status mode of the users (e.g. Available (Green), Do Not Disturb (Amber), Absent (Grey). You can also select the options (Phone, Mobile, Message etc.) by right clicking on the user icon. The GUI includes two panels: the Call Panel which is used for call control and the Accessories Panel which is used for displaying all the functions of phone management. The Call Panel is always visible when the GUI is in the foreground. The Call Panel allows you to monitor calls in progress; forward the call; hold and conference; select your communication device; change user status and the GUI settings. The Call Panel also alerts users by showing notifications for new messages (short messages or chat), voice mail messages and missed calls. You can access the various functions of the GUI by clicking on tool bar selections on top of the window.